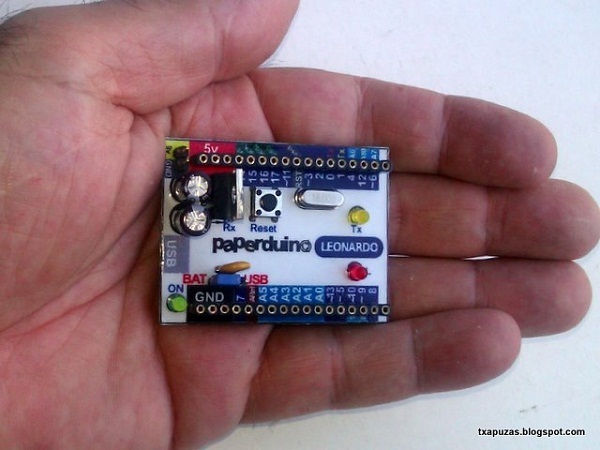 Here (machine translation) is a DIY single-layer version of the Arduino Leonardo. The blogger goes into detail on how to build one yourself. Everything is covered from preparing and etching your own DIY board, to fine pitch soldering of the ATmega32u4 IC. Once you have built your board, they show you how to upload a bootloader into the microcontroller. The Arduino Leonardo is a new platform from the Arduino team that uses the ATmega32U4 uC with built in USB capability. This eliminates the need for the expensive FTDI USB-to-serial ICs and keeps the costs down. This entry was posted on Friday, December 16th, 2011 at 11:00 am	and is filed under project logs. You can follow any responses to this entry through the RSS 2.0 feed. You can skip to the end and leave a response. Pinging is currently not allowed. oooh man! this is what i want to do..single sided arduino! Cool idea on the silk screen, but I think it would yellow out/look bad/become fire hazard after awhile. Once upon a time they used to add paper labels inside of electronic components and after a few years they would peel off and end up on the bottom of the enclosure or occasionally you would find one slightly blackened or toasted. It might not be as big of a deal with a low-powered Arduino, I’ve just had a not-so-hot history with paper inside electronics. You must be an older technologist like me, Mike. I remember “cheater cords” and that chintzy fiberboard backing they used to have on the back of tube-based consumer electronics. I was 8 or 9 yrs old when I started taking stuff apart in the early 60s…The survival/repair percentage of stuff subjected to my “tender mercies” has greatly increased over the years! Yep, Ed I’m a bit of an oldie, but you have a few on me there. I was just poor so I had wait for the price to come down to dig into 1950’s electronics until the late 70’s. I think the draw to paper on electronics is the same as it was before but only those old enough to remember the drawbacks are not doomed to repeat. WARNING: if you want your projects to be around for years don’t put raw paper on them. Man I remember the fiberboard…our old tube RCA TV was 1/2 constructed of the stuff….probably part of the reason I still hate MDF till this day. They used that stuff in everything in the 70’s and it always rotted and fell apart, swole with humidity or just broke over time. Just like KFC they figured if they called it MDF no one would think there was fiberboard in it. WARNING: if you want your projects to be around for years don’t use MDF. Hi. Please help me to confirm whether this DIY version of Arduino Leonardo has a 5-volt power supply. Appreciate helps. Thanks. There’s a 7805 with a jumper bypass. The bypass (battery power?) will take whatever ATmega32U4 can handle. The 7805 should get 7V+.